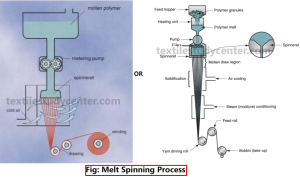 Melt spinning uses heat to melt the polymer to a viscosity suitable for extrusion. This type of spinning is used for polymers that are not decomposed or degraded by the temperatures necessary for extrusion. 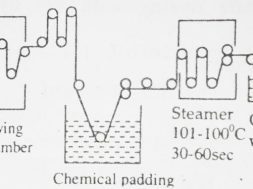 This method is used by 70% of the fibers. 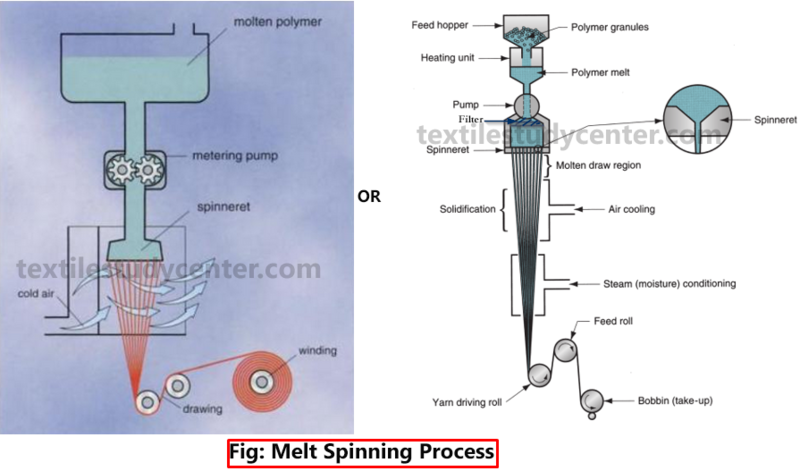 ❶ In melt spinning, polymer is heated and it melts to form a liquid spinning solution or dope. ❷ Chips of polymers are fed to a hopper which is heated. There is a grid (sieve) at the base which permits only molten liquid to pass through. ❸ Then the solution is purified by filter. 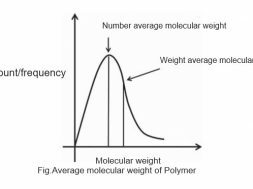 ❹ The molten polymer is extruded at high pressure and constant rate through a spinneret into a relatively cooler air stream that solidifies the filaments. ❺ Finally the filament yarn either is immediately wound onto bobbins or is further treated for certain desired characteristics or end use. 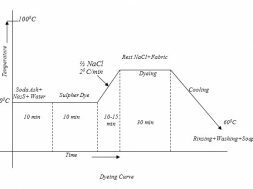 Example: Melt spinning is used for the production of polyester, nylon, olefin, saran and glass fibers. 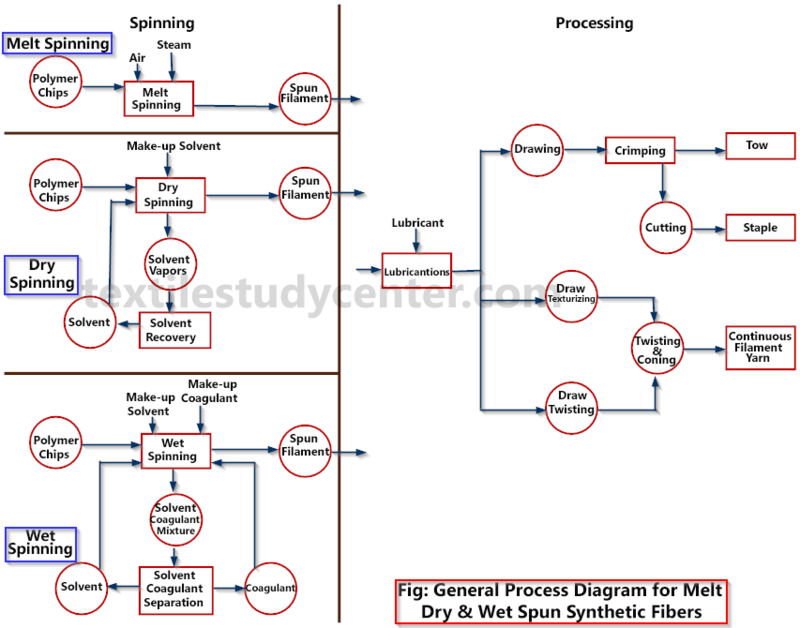 Dry spinning is used for polymers that need to be dissolved in a solvent. 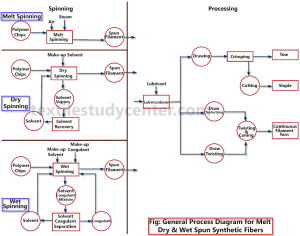 Solvent spinning (dry spinning and wet spinning) are used by 30% of the fibers. 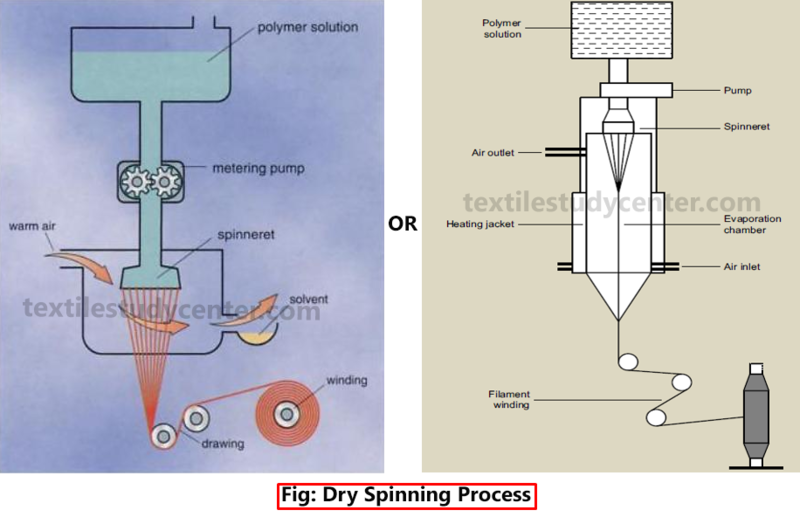 ❶ In dry spinning, a volatile solvent is used to dissolve the raw materials and form a salutation. 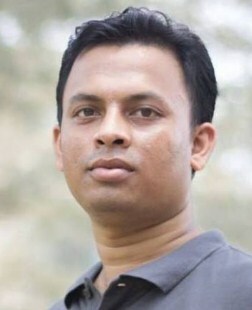 ❷ Then the solution is purified by filter. ❸ The solution is extruded through a spinneret into a warm air chamber where the solvent evaporates, solidifying the fine filaments. ❹ Finally the filament yarn either is immediately wound onto bobbins or is further treated for certain desired characteristics or end use. 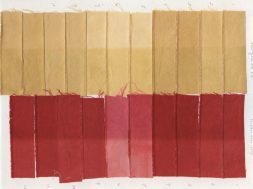 Example: Dry spinning is used in the production of acetate, triacetate, and some acrylic, modacrylic, spandex, and vinyon (PVC,PVA) fibers. This is the oldest, most complex and also the most expensive method of man-made yarn manufacture. 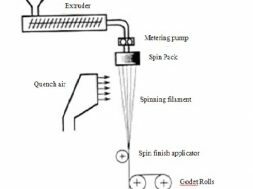 This type of spinning is applied to polymers which do not melt and dissolve only in non-volatile or thermal unstable solvents. 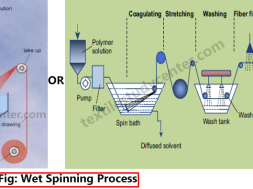 ❶ In wet spinning, a non-volatile solvent is used to convert the raw material into a solution. 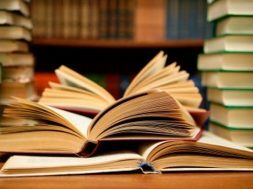 ❷ The solvent is extruded through the spinneret either by simply washing it out or by a chemical reaction between the polymer solution and a reagent in the spinning bath. 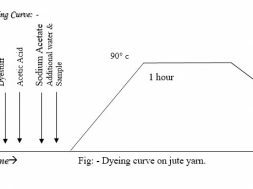 ❸ After extrusion, the solvent is removed in a liquid coagulation medium. 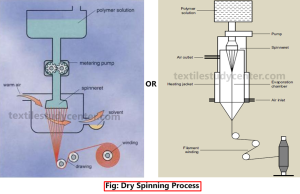 Example: Wet spinning is used in the production of aramid, Lyocell, PVC, Vinyon (PVA), viscose rayon, spandex, acrylic and modacrylic fibers.